But Sesame Street was only the beginning! Just recently a friend added a picture to his social networking page and it was of a wonderful fantasy movie characters with that large yellow Bird who I know you probably all have at least heard of, and it brought out the kid in all of us who responded. But it also brought out the names of all our favorite characters in the show as well. I have to say that I really giggled and was involved in that online conversation! In thinking about the shows and movies and all the various characters I remember there is more than a bot of wonder in all the learning and enjoyment that grew out of the creative genius of a man who shared his inner child and the fun that was there. We rally did lose him way too soon. 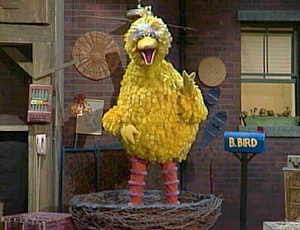 My favorite character of all those Henson created has to be Big Bird. The wonder and naiveté of his child-like character was fun to watch develop from the those early Sesame Street days. His endearing imagination and the excitement that came with every learning experience made me believe that learning could really be a fun thing for my children and grandchildren. It is a sad thing to see the way our schools have gone. There now is a passion for teaching to the tests rather than exciting a child’s imagination. Somehow, I hope we can find a way to balance the need for testing and the desperate need to capture the excitement for learning in children of all ages again. We are not going to save the wonder for life in the lives and hearts of of children today if we don’t. Last September would have been Jim Henson’s 75th birthday and I would love to celebrate changes toward a more excited form of learning melded with what we need in being accountable to what our children learn to bring them into this century’s way of learning in America.